Easter is one of the most highly attended church services of the year. I suspect this isn’t new information to most of you involved in ministry. You have likely experienced the significant influx of attendees on Easter and Christmas. Though these holidays represent the most widely attended church services of the year, there are differences between them. In this article, we’ll explore who’s most likely to attend church this Easter, and how we can prepare for them. Understanding who and why people are attending peak Sundays should drive us to think more strategically and pray more specifically for the opportunity before us. While we may see a similar influx of people on Christmas and Easter, the make-up of attendees is different at each of these services. 1) How does welcoming disengaged Christians differ from engaging with the unchurched? 2) How can we be more strategic in our engagement and messaging to both types of visitors? Learn how to leverage your church’s most valuable asset—your building—to build community, accelerate growth, and improve stewardship in your congregation. When it comes to welcoming guests at church, you may be familiar with the “10-Second Rule.” This rule of thumb states that a person will decide whether or not they will return to your church within the first 10 minutes of their visit. This is the typical amount of time it takes for a person to get their car parked and find their way to a seat in your worship service. This means that before a guest has an opportunity to hear your music or the sermon, they have already decided if they’re ever coming back. Creating a good first impression is critical. 1. What will be your guests’ first experience? Website: More often than not your church’s website is the first experience guests will have with your ministry, especially if it’s their first time to your church, or if they haven't been there for a while. Does your website convey who your church is? - When and where: Be sure to be extremely clear about where your church is and when your Easter services will be happening. Do not make people search for this basic information. - What to expect: Basic questions you should answer are: How long will the service be? Where do you enter the building? Is there something for children? How will people be dressed for Easter? - Clean it up: Make sure your property is cleaned up debris and trash. - Give clear directions: Let people know where to park and what entrance to use. Directional signage doesn’t have to be permanent and expensive. You can invest in some portable exterior signs that can be very welcoming and be placed at strategic locations to give clear directions. - Greet guests: Make sure you have people positioned to greet people at the doors of your church. - Clean it up: Just like the parking lot, make sure the inside of your building is tidied up. Clean what needs to be cleaned and get rid of the clutter, especially in and around your entrances. - Communicate your values: Try to ensure that people have a sense for what you value when they enter your building. 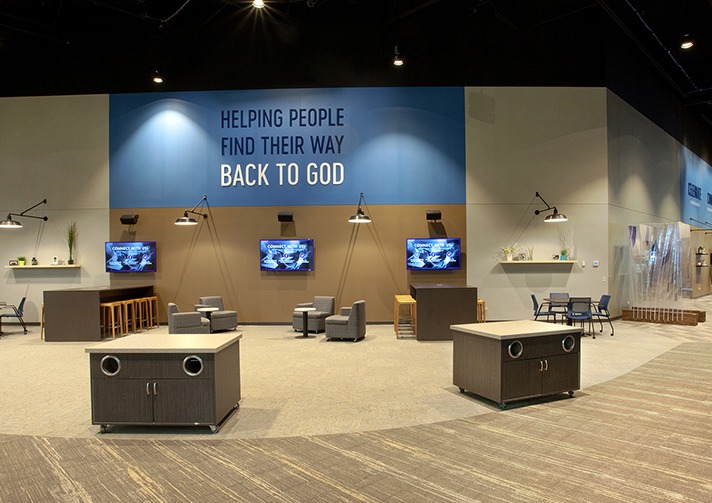 Things that communicate your values include language and visuals on your walls, and the care given to key ministry spaces like children’s check-in, lobby or connection space. Never forget that the way your hospitality team engages guests speaks volumes about what your church values. 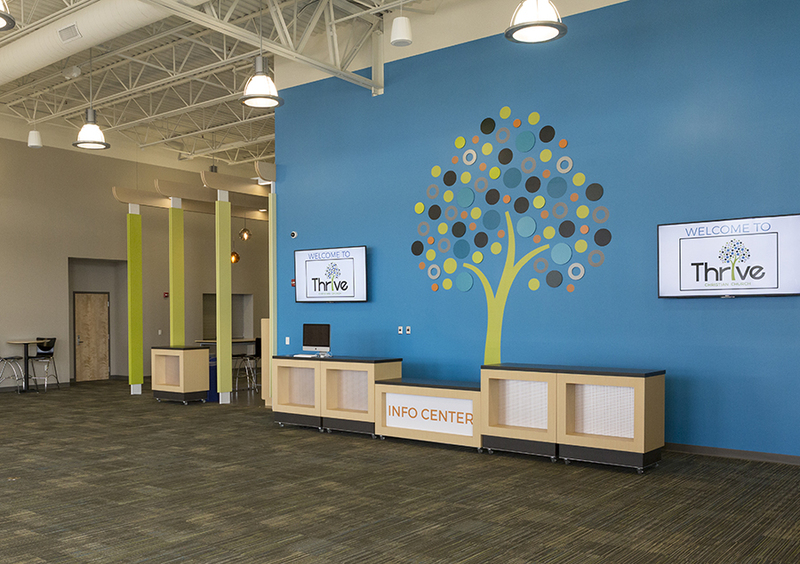 - Create Space for Connection: Your lobby can be a great place for people to connect, but it should be designed in a way that lets a person engage at a level and a pace that is comfortable for them. 2. How are you removing the uncomfortable unknowns? Clear Wayfinding: Feeling lost is one of the most uncomfortable things a guest can feel. - Walk through the various entrances of your church and pretend you are a first-time guest. Would you know how to get to the key spaces in your church? 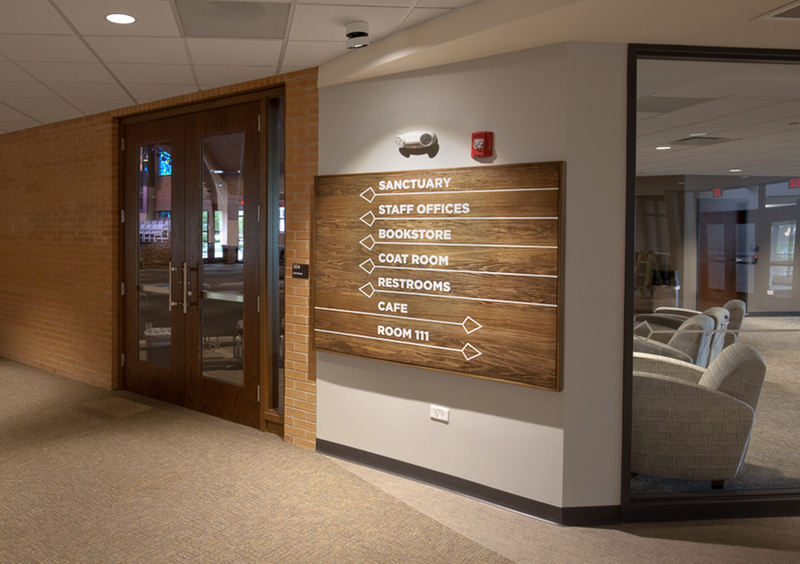 - Make sure you have wayfinding (directional signs) that guide people to key spaces in your church. 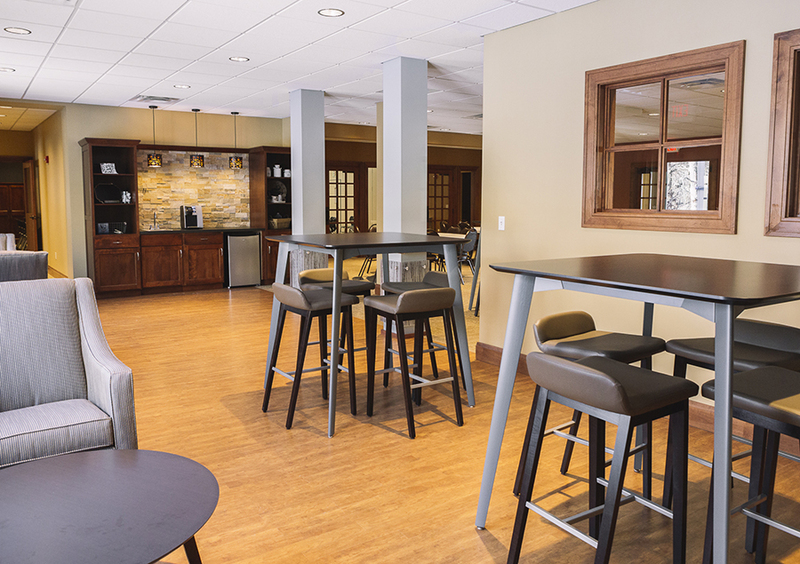 These spaces may include the sanctuary/auditorium, children’s check-in, nursery, coffee and restrooms. - Think about visiting moms and dads. Will they struggle to know where to go with their children and what your church’s process is for checking-in/checking-out kids? - Help new guests navigate the building. I would encourage your team to NEVER POINT people where to go, but rather walk with them to wherever they need to go. It gives your guests peace of mind, and it gives you more opportunity to get to know them. 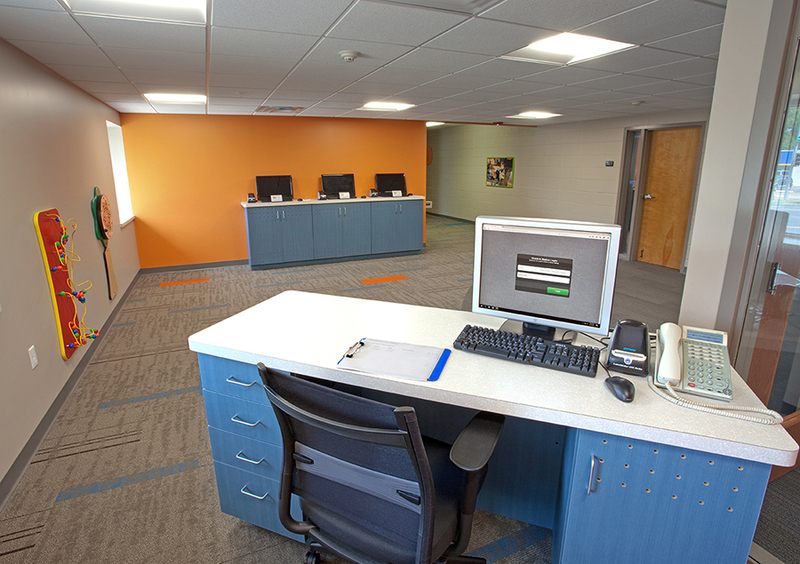 - Help guests with children find the kids check-in, nursery, or youth space. I would also recommend that they remain with the guest as they get their child checked in and then offer to introduce them to whomever is leading that ministry. This will often help parents feel more at ease about leaving their children. Stay with the parents to help them navigate to the next step on their journey. - Remember peoples’ names. Dale Carnegie once said, “A person’s name is to him or her the sweetest and most important sound in any language.” I have received feedback from countless new guests that the thing that made them feel the most cared for during the visit to a new church was when someone they met addressed them by name after the service or upon their second visit. This could be one of the most impactful things your team can do on Sunday morning! 3. Are you giving guests clear next steps? - Actions Centers: Create places where people can ask questions and/or see the opportunities available for taking a next step at your church. This space should be visible leaving the sanctuary. I would encourage you to have a volunteer at or near this action center. - Create appropriate Next Step opportunities: People attending your service will be in varying stages of their spiritual walk and may have encountered God in very different ways during the Easter service. Some may be ready to re-commit their life to Christ, get connected to a small group, begin serving, get baptized or become a member. Whatever the stage, your team should be ready to help people take that next step. - Follow up: For those guests that share contact information with you, have a plan to follow up promptly with those individuals. Here are “Seven Ideas For Effective Church Guest Follow-up” by Jonathan Howe. My last words of advice would be to pray for and expect guests to arrive this Easter. It may be a person’s first time walking into a church, or first time walking into a church since last Easter. Either way, I encourage you to be intentional about creating an experience that removes any obstacles or distractions from them having an encounter with the risen Jesus. Josh Gregoire joined Aspen Group in 2004. Over the years he has played a role in design, construction, IT, marketing, project development, and business development. Since 2014, Josh has served as Church Relations Coordinator. 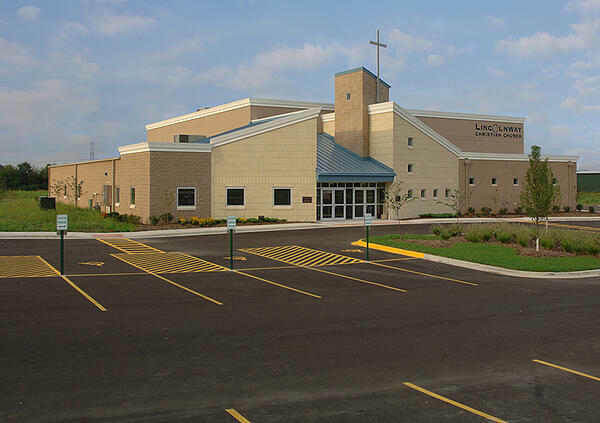 He is often the first point of contact for churches who are considering a church facility renovation or new building project. His experiences at Aspen and in pastoral ministry have prepared him to come alongside church leaders and help them navigate the earliest conversations and stages of a facility project. 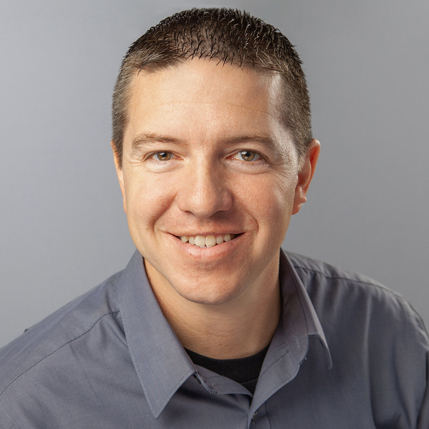 Josh also serves as the Discipleship Pastor in his home church, providing vision and leadership for ministries such as Small Groups, First Impressions (hospitality), and Next Steps. He has also served as his denomination’s District Sunday School and Discipleship Ministry Chair, and he continues to provide coaching and training to leaders and volunteers in these areas as needed. He and his wife Missy are raising two kids.